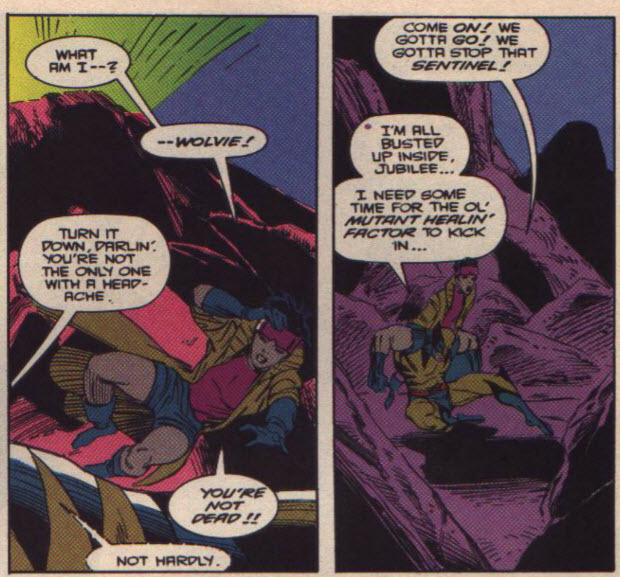 Wolverine & Jubilee fight the self-aware Sentinel. 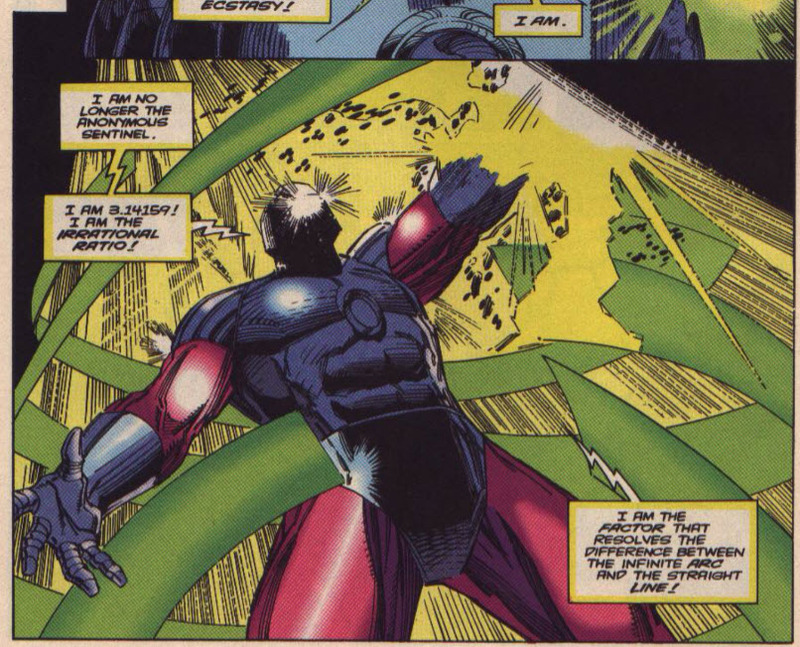 The rogue Sentinel leaps into the vortex created by Gateway's bullroarer with Jubilee in tow. Wolverine follows, and they emerge outside the Ant Hill, an old Sentinel base. Wolverine manages to free Jubilee, but the Sentinel blasts them both before entering the Ant Hill, seeking the beam projector weapon with which the earlier Sentinels had attempted to eradicate life via solar flare. Outside, Wolverine & Jubilee wake up, but Wolverine needs time to heal. Jubilee drags him up to the top of the Ant Hill, and he recovers soon enough to fight off a pack of dingoes. They spot the Sentinel as it aims the beam projector at the spot where the sun will rise, and it attacks them again. 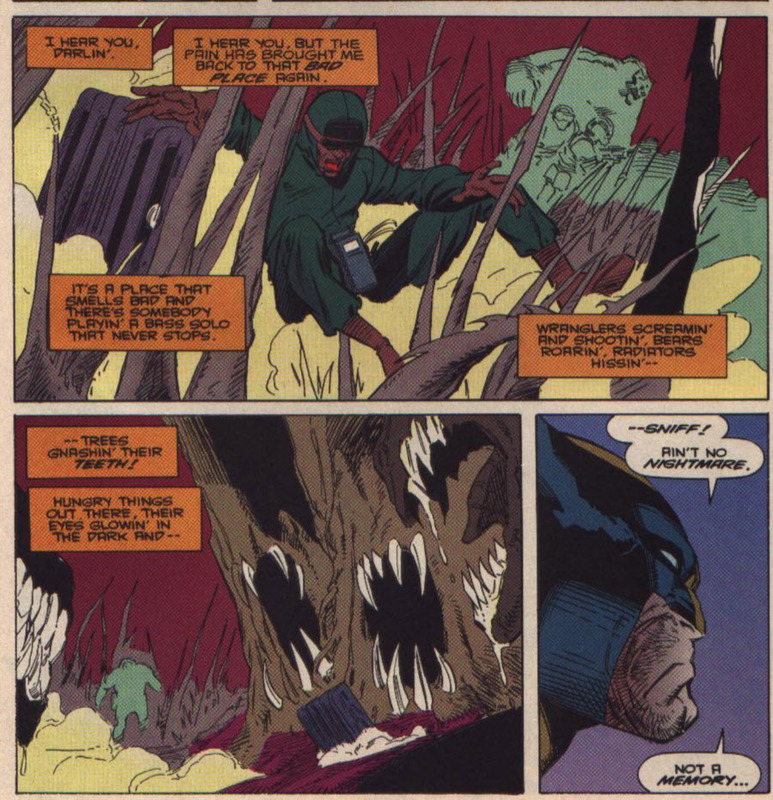 Wolverine manages to cut off its head, but as it tumbles back into the Ant Hill, it activates the remaining older Sentinels inside the base, who immediately target Wolverine & Jubilee. The bulk of this issue takes place at the Ant Hill, an Australian Sentinel base featured in Avengers #102-104, in which a group of Sentinels attempted to destroy humanity via solar flares (which will also wipe out all the mutants) in a follow-up to Roy Thomas' Sentinel story in X-Men #57-59. 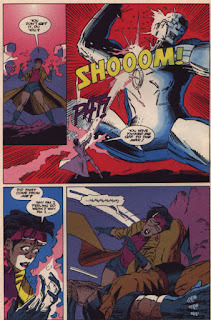 It popped up again in West Coast Avengers #1 being used by Quicksilver (during one of his more prolonged heel turns, circa X-Factor Annual #2), and then again in Marvel Superheroes #6-8, one of those series intended as a dumping ground for inventory and fill-in stories, in a story featuring the Outback Era X-Men (that I should probably review as a Retro X-amination at some point in time). Curiously enough, in that story Wolverine clearly visits the Ant Hill, even though here he says he's never been to the place before (suggesting Wolverine pays as much attention to those Marvel Superheroes stories as I do). The sentient Sentinel who kicked off this story adopts a specific designation in this issue: 3.14159, which are the first six digits of Pi. Jubilee fires off a super-charged firework at the 3.14159, something which surprises even her. 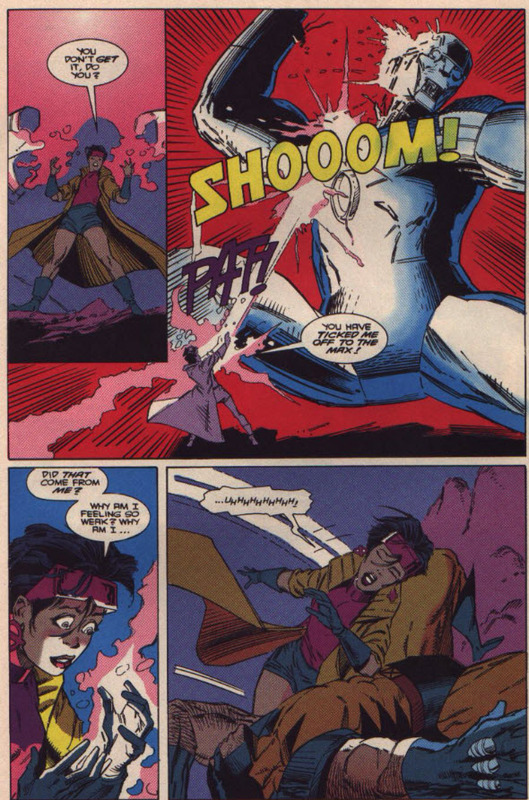 This marks the beginning of an off-and-on "Jubilee is more powerful than she knows" subplot that will follow the character to Generation X, not unlike the similar Iceman subplot at this time. Wolverine describes the painscape to Jubilee. Last story, Wolverine's shredded hamstring healed itself while fighting Sauron; in this issue, he tells Jubilee he needs time to heal. 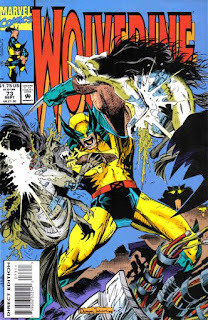 This is another example of what's quickly becoming the "Larry Hama middle chapter" issue, in which there's a bunch of Wolverine fighting stuff but not much plot-related momentum. The most notable thing about this issue is the use of the Ant Hill and the Sentinels therein, which represents a pretty deep historical cut, especially for someone like Hama (it'd be a deep cut coming even from a Gruenwald or Thomas). As a kid, I'd never even heard of that story before (and in those pre-Internet days, had to read about it via the summaries in the Avengers Index), so this issue has always stuck in my mind as "that one that introduced me to an obscure Avengers story where they fight Sentinels", but aside from that, there's not much going on here, especially with most of the Jubilee material that highlighted the previous issue momentarily set aside, giving us the second story in a row with a pretty basic middle chapter. Next week: X-Men #24, X-Force #26 and Excalibur #69. I had to Google it because I had no idea, but apparently a formicary is an ant colony. So "The Formicary Mound" = "The Ant Hill". I love Larry Hama. I knew this purely thanks to an article on Ant-Man that I wrote back when the movie came out and remain delighted that I can still learn new words from superhero comics.